Search engine optimization (SEO) is a series of common online marketing tactics used for businesses worldwide. SEO requires continuing action and attention to bring organic traffic to your plumbing website. Traffic from this inbound marketing technique is a good success indicator, but it’s not enough on its own. Return on investment is (ROI) gives measures what your organic SEO is doing for your plumbing website. 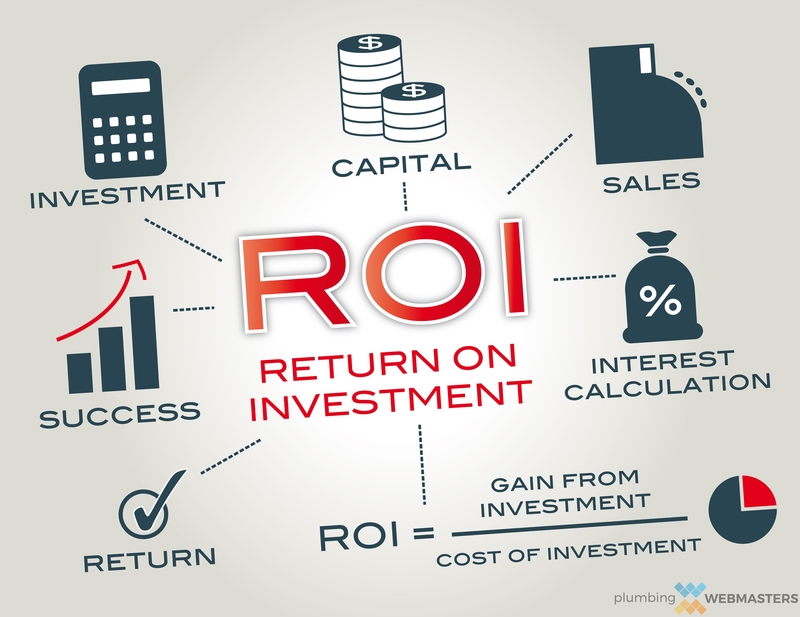 Measuring SEO ROI has the following benefits for your plumbing company. Benchmarking You set measurable and trackable goals for your SEO. 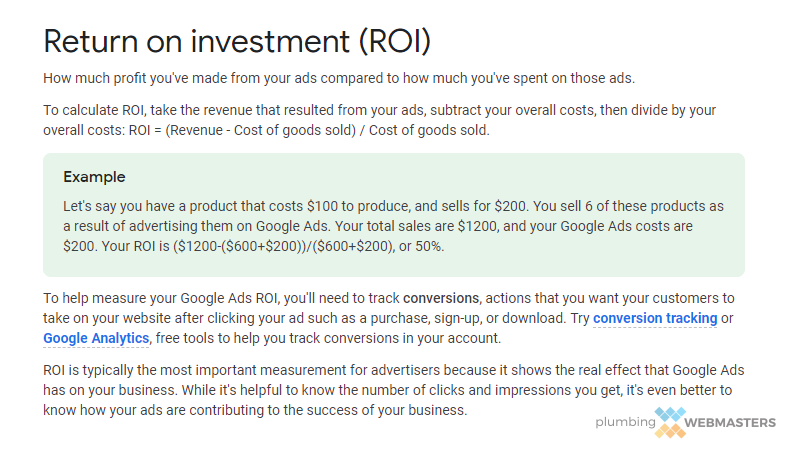 Evaluation Defined ROI goals let plumbers evaluate the performance of your SEO marketing strategies. Flexibility There are multiple methods available to measure your SEO ROI to choose from. Strategy: Measuring SEO ROI allows you to adapt your strategies to improve your returns. ROI is partially measured by data projections. There are plenty of analytical tools that examine how your SEO strategy is working to form accurate estimates for business decisions. 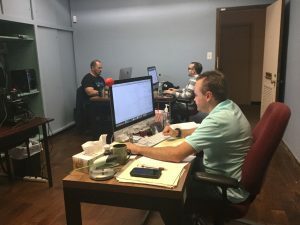 That means that if a certain part of your strategy isn’t bringing in the desired amount of traffic or conversions according to the ROI data, it needs to be adjusted. For more information about increasing your plumber SEO ROI, contact the experts of Plumbing Webmasters at (877) 388-9884 today! The point of plumber SEO is to bring in more business and increase overall profits. That’s the point of any business and the point of most marketing strategies. But you can’t start calculating ROI right away until you’ve developed an attribution model. These accurately compute return on investment. Without accurate data, your equation will not be an actual representation of SEO ROI. An attribution model is a rule or set of rules that assigns credit to your conversion paths. This means that it weighs the value of different parts of your SEO strategy so you see what part is working best. Plumbing Webmasters creates you an attribution model with the following tools. Call To Action: This is a defined user action that indicates a conversion, like an embedded phone link mobile users click on to call directly. Google Analytics: This has custom reporting that measures all aspects of your website’s performance. Google Search Console: This adds user behavioral data, including bounce rate and CTR. Your plumbing company should consider different variations of your attribution models to ensure data accuracy. First-touch attribution models value the initial actions of your sites’ visitors, while last-touch attribution models value the final user actions. There are also fractional attribution models that value of your website’s visitors actions equally. All of these variations offer different insights into your online business presence and are worth a thorough examination. Once Plumbing Webmasters has established your attribution and measured your data, we calculate your SEO ROI. There are free ROI calculators if you want to calculate your ROI by yourself. Hubspot offers a reliable ROI calculator you use with your own manually developed equations. We offer an example calculation process listed below. If your ROI expectation was 4 percent, your SEO ROI fell short by eight-tenths of a percent. If your benchmark ROI goal was only 3 percent, you exceeded your goal and your SEO is working effectively for your plumbing business. Accessing your data and finding out what part of your strategy is underperforming is a great way to tweak your SEO and make it work more efficiently for you. When you hire Plumbing Webmasters, we take over your online content management and monitor your plumber SEO ROI so that you don’t have to worry about it. When you trust your SEO strategy to the experts, you don’t have to worry about if you’ll meet your benchmark ROI. We’ll work towards reaching and exceeding your goals every month. For more information about how Plumbing Webmasters uses SEO ROI to enhance your online marketing strategy, call (877) 388-9884 today! Updated on April 9, 2019 at 4:56 pm by Plumbing Webmasters.